In the gun lobby’s arsenal of propaganda, the claim that guns make people safer may be the most potent. After all, while gun advocates make grandiose—and historically inaccurate (Consortium News, 12/21/12)—claims about the Second Amendment being designed to enable armed citizens to resist government tyranny, no sane person believes individuals armed with handguns and rifles would stand a chance against a trillion-dollar 21st century military backed by vast surveillance systems. But protecting one’s family, home or person? That seems sensible enough. If guns make us safer, as they say, then having a gun for self-defense isn’t an irrational choice. The one true thing that we know about the gun debate here at home, that neither side has a monopoly on the truth, or even the facts, because the facts can be so hard to establish. One side has studies linking gun ownership with violent death. But correlation is not causation. The other side has research showing when people are allowed to carry concealed weapons, violent crimes slow down. Yet newer studies cast doubt on that conclusion. But is it really hard to study the effects of guns on public health and safety? And is the debate merely between competing articles of faith? Perhaps more to the point, does the evidence support Schieffer’s and the others’ claims that guns are a rational choice for self-defense? The pro-gun crowd sure wants you to think so, promoting studies over the years claiming guns are used defensively thousands of times per day and that broader gun ownership makes communities safer, and repeating anecdotes in which guns are reported to have thwarted crimes. A favorite study of these advocates is 1995’s “Armed Resistance to Crime: The Prevalence and Nature of Self-Defense With a Gun” (Journal of Criminal Law and Criminology, Fall/95), by Gary Kleck and Marc Gertz, which found that guns were used defensively about 2.5 million times annually in the U.S.—or almost 7,000 times a day. Researcher John Lott conducted another study favored by gun advocates, published in his 1998 book More Guns, Less Crime, which claimed that increasing numbers of concealed carry permits in a given area are associated with decreasing crime rates. Both studies have been convincingly challenged in the scientific community. In a 2004 meta-study of gun research, the National Research Council of the National Academies of Science found that Lott’s claims were not supported by his data. And when Lott misrepresented the report (New York Post, 12/29/04), the NAS published a letter (Deltoid, 1/26/05) listing his distor-tions. Shooting Down the More Guns Less Crime Hypothesis (11/02), a paper pub-lished by the National Bureau of Economic Research, found crime actually increased in states and locales where concealed carry laws had been adopted. The Harvard School of Public Health’s David Hemenway took on Kleck in Survey Research and Self Defense Gun Use: An Explanation of Extreme Overestimates (Journal of Criminal Law and Criminology, 1997), demonstrating that because of the nature of the data, Kleck’s self-reported phone survey finding 2.5 million defensive uses of guns per year was wildly exaggerated. For example, Kleck says guns were used to defend against 845,000 burglaries in 1992, a year in which the National Crime Victimization Survey says there were fewer than 6 million burglaries. A National Crime Victimization Survey report, controlling for many of the methodological problems in Kleck, supported Hemenway, finding 65,000 defensive gun uses per year (NCVS Report, 1997). Current NCVS estimates are in the 100,000 range. To assess the benefits and costs of pervasive gun ownership—there are currently 300 million firearms in the U.S., and roughly 80 million gun owners (CNSNews.com, 2/4/13)—it’s useful to compare the self-defense numbers to the gun crime numbers. The National Institute of Justice reported that in 2005, “11,346 persons were killed by firearm violence and 477,040 persons were victims of a crime committed with a firearm.” Or, to put it in starker terms, the FBI’s Crime in the United States report for 1998 found that for every instance that a civilian used a handgun to kill in self-defense, 50 people lost their lives in handgun homicides. A New England Journal of Medicine study (10/7/93) in 1993 concluded that a gun in the home raised the chances someone in a family will be killed by nearly three times, with the danger to women—who are more likely to be killed by a spouse, intimate or relative—even greater. A 1997 study in the Archives of Internal Medicine (4/14/97) reinforces that danger, finding that the homicide risk for women increased 3.4 times in a home with one or more guns. Taken together with the heightened risk of suicide and accidental deaths posed by guns in the home, these numbers demolish the argument that guns enhance family protection. In addition to underplaying the statistical case that guns are a destructive force in society, the media have largely ignored experts who can explain the practical reasons why guns are not necessarily a rational choice for self-defense. 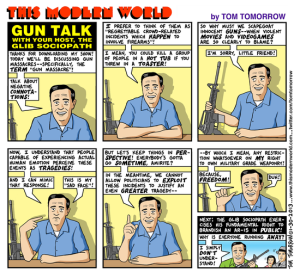 An exception was 20/20’s report, “If I Only Had a Gun” (ABC, 4/10/09), which explored the issue with firearms experts. 20/20 took a group of college students of varying familiarity with guns, and provided them with professional training exceeding the level required by most states for concealed carry permits. Then the producers recorded the students reacting to simulations in which an aggressive, active gunman entered a classroom. In every simulation, the student failed to stop the aggressor and was badly or fatally wounded; in one instance, the student narrowly missed shooting a victim of the assault. According to the weapons experts 20/20 consulted, only professionals who drill continuously in live shooter situations can hope to succeed in such chaotic situations. Firearms instructor Glen Dorney told host Diane Sawyer, “Even police officers, through extensive training, if you don’t continue with your training, ongoing training, it’s a perishable skill. You’ll lose it.” When Sawyer asked him, “How long before you’re going to lose it, even at your level of training?” Dorney answered, “If you go for a month to two months without training, you lose it.” A Time feature (1/16/13) that looked at how unpredictably even well-trained police respond to crisis situations came to similar conclusions. The debate over the wisdom of wholesale arming of citizens for the purpose of self-defense is not a debate between two sides arguing “articles of faith,” and there is no shortage of facts. The verdict has been in for years: Guns, as they are bought and sold and regulated in U.S. society, do far more harm than good. And if we had a media culture where public health actually mattered in discussions of guns, the argument that they are helpful for protection or self-defense would be relegated to the margins.